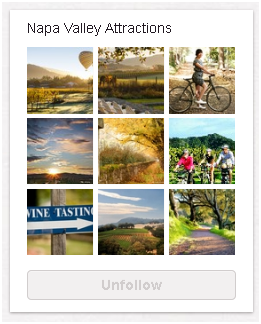 » Case Study: Is Pinterest Right For Hotels? Case Study: Is Pinterest Right For Hotels? 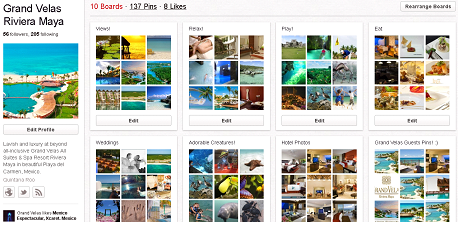 Pinterest is a new social network that lets users organize and share images. It can help you plan your wedding, find delicious new recipes, and redecorate your home but the question we are getting from our clients is: should hotels be on Pinterest? A lot of articles have been written about how Pinterest can be used for businesses. 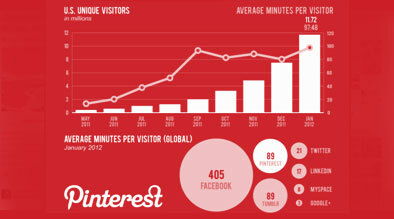 However, few articles show if Pinterest has concrete ROI potential for non retail businesses. Before taking a position on Pinterest, we decided to experiment with four different hotels to see if it’s worth ours and our client’s time. Created boards with different niche categories such as Local Food, Weddings, and Beaches. After running our case study for 5 weeks we measured engagement: repins, likes, comments, followers, and traffic to website. We’ve outlined our conclusions below. 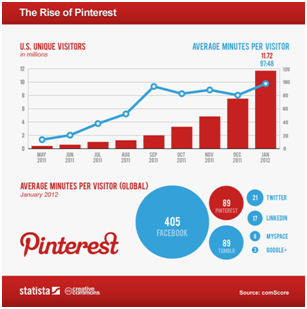 Pinterest is viral and great for brand awareness. If you are a hotel looking to expand your social media presence and increase brand awareness, Pinterest is the place to be. It not only gets 11.7 million unique visitors per month, but it also gets devoted visitors. In January, 2012, an average of 89 minuteswas spent on the site per user. Unlike content driven channels such as Twitter (21 minutes) and Google+ (3 minutes), Pinterest falls into the visually rewarding category like Facebook (405 minutes) and Tumblr (89) minutes making users very engaged in these channels. Pinterest is for hotels with beautiful imagery. While some businesses lack visual content, hotels usually have great imagery making Pinterest a great channel for the hospitality industry. In our case study, we saw that hotels with the best imagery like Grand Velas Riviera Maya, located in Mexico, got the most website traffic, likes and repins. We should note however, that new concerns regarding copyright law have recently come to light. While Pinterest figures out the best way to handle this growing concern, we recommend that you pin images from your website or images that you have rights to. Pinterest is not a significant revenue driver for hotels. If your sole goal is to increase your hotel’s revenue, Pinterest might not be your marketing channel of choice. While online retailers have seen a lot of revenue coming from Pinterest, that is not the case for hotels. For example, in five weeks, Inn on Bourbon, while they had 176 repins within Pinterest, only had one person go to the booking engine. Pinterest is best used for social engagement and brand awareness and should be used as a boost if you are already active on other social media channels. Pinterest is not for linkbuilding or driving traffic. While Pinterest’s site domain authority is great, and many people are repining images that were originally linked your website, the link juice passing through is zero. Like Facebook and Twitter, Pinterest is a no-follow link platform. Pinterest is also not a strong traffic driver for hotels as most people repin images but they don’t go to the original site. Grand Velas Riviera Maya which had the most traffic from Pinterest (34 visits), had 78 times more traffic coming from Facebook. Pinterest might be the most fun and visual rewarding marketing channel to work with, but it’s very time consuming. Photos should be uploaded consistently throughout the week and the day because activity is when you first post it. It also takes time to add value to your Pinterest profile, add compelling images to your website, write keyword rich descriptions, find relevant accounts to follow, and engage with other users. There is also no dashboard or analytics available making it difficult to gather results in a timely matter. Since 80% of users are women, post photos geared towards women’s interests such as food and recipes, fashion, weddings, architecture and home style. Photos should be uploaded consistently throughout the week and the day because engagement happens when your pin is at the top of the feed. Promote through other channels: add a Pinterest follow button on your website, promote your Pinterest account on Facebook, Twitter, Google+ and Blogs. Interact with other users by liking and leaving comments on their pins. When people see you are interacting with them, they might choose to follow you back. Pinterest is best used for creative marketing so don’t bombard pinners with self promotion. Make people look forward to your pins because they are interesting, not because you are trying to sell your hotel. While Pinterest is still an experiment from the marketing perspective, we can tell from this case study that like other social media channels, it is best used for engagement and brand awareness. 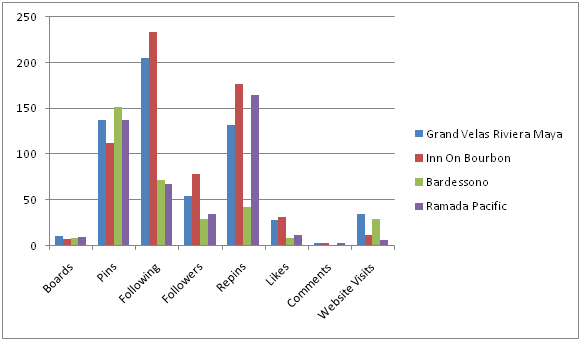 In only five weeks, three out of the four hotels had more than 100 repins and a significant amount of followers. Although users repinned beautiful hotel photos onto their “Dream Vacation” boards, they rarely went directly to the source of the image, so the referral traffic to the website was consistently low and traffic to the booking engine was even lower. So if your solitary goal is to increase revenue, your resources may be better spent elsewhere. However, if your goal is to increase brand awareness, and you have the time and resources available to invest in Pinterest, be sure to follow our best practices outlined. Lastly, as with all marketing strategies, continue to test different strategies to figure out what works best for your business. Excellent post. I have been looking around to see if I Could find any hotels already using Pinterest and the lessons learned. You make a great point that Pinterest is not a a significant revenue driver for hotels, however I think that this will change in the future with place a good strategy in place to attract niche markets who will rely on members in the Pinterest community to share their thoughts on destinations and hotels.